Mount Semeru Trekking Tour Package. 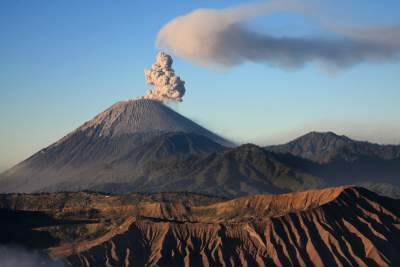 Travel package to climb to the top of Mount Semeru for 3 days 2 nights. A trip to Mount Semeru is the chance to hike the tallest volcano on Java Island. The Highest Semeru Mountain On the island of Java Indonesia, or many of the so-called Mahameru peaks 3,676M and the top of the mountain Saloko Jogring is still an active volcano and the highest mountain on the island of Java.Completed with visit and camping to scenic kumbolo lake. Climbing to the summit of Mount Semeru from Surabaya or track and routes from Malang. Pick-up in Surabaya / Malang in the morning and then drive to Tumpang (Semeru Via Malang) or drive to Cemara Lawang (Semeru via Surabaya). Arrival in Tumpang or Cemara Lawang then proceed to the village Ranupane by jeep 4WD. After arriving in the village Ranupane a check of preparation, logistics and administering licensing climbing. After all the preparation is complete and permits already fixed, then start a light trekking towards Ranu Kumbolo around 4-5 hours, breaks and lunch at ranu Kumbolo. After the break continued trekking to wards kalimati base camp. After arriving in kalimati base camp set up tents, dinner and stay overnight. Wake up at 12 am and preparation for the ascent to the summit Mahameru. start climbing towards Arcopodo approximately 2 hours, and proceed to the summit Mahameru (3,676 masl) duration of three hours of hard trekking. After arriving at the summit to enjoy the beauty and exploration peak Semeru / Mahameru highest mountain in java. Satisfied at peak then back to Kalimati base camp approximately 2 hours. Rest and breakfast, then continue to Ranu Kumbolo about 3 hours,camping at Ranu Kumbolo. free program. Morning enjoying the beauty of the sunrise at Ranu Kumbolo. After breakfast explorations Ranu Kumbolo and further preparation back to the village Ranu Pane approximately 4-5 hours. After arriving at Ranu Pane transfer back to Malang / Surabaya. Arrival at your location in Surabaya / Malang ,Semeru Trekking Tour Package ended. There are four camping areas. First, at Ranukumbolo, a beautiful lake, where you can find the last water resources on the route. Second, at Kalimati, which is situated at the borderline between a savannah plain and the steep ascent through mountain forest ,up the actual volcano. There is a spring at a distance away from Kalimati. Third and fourth, at Arcopodo and Killik further up in the forest, where you will find several flat areas.